Les Paul is without doubt a formidable figure in the guitar world. His technical accomplishments perhaps are the most important, with multitrack recording and electric guitar innovations being among them. His playing is often like a silky version of Chet Atkins, and his chosen genre is MOR, with soft jazz and country light as prime influences. Most of his recordings feature his wife Mary Ford on vocals, with the occasional instro popping in. Lovers Luau is an all instrumental album of Hawaiian tourist music, with some surprisingly surfable material, and even some surf set ready tracks. If it wasn't for the extremely slow pace of most of the music on this CD, it would be more obvious how surfable the music can be. 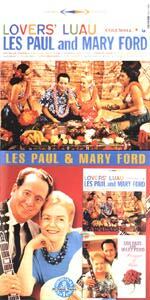 The review only covers the Lovers Luau album. Bouquet Of Roses is a country vocal release. Moving at the unhurried pace of plentiful islands perpetually in the upper seventies, "Blue Hawaii" slushes and gushes with tourist dreams of poi and luaus. Sliding slowly into slumber on an air mattress floating in a lagoon... yes, it's kinda like that. Softly sipping an umbrella drink on the verandah overlooking the royal palace, one wonders where life's concerns went. Wait, they're right over there! The chorus seems more obvious here, making the track fall further into tourist territory. This is among the more surfable melodies in this genre. I can easily imaging the Blue Hawaiians, the Aqua Velvets, or Slacktone nudging this right into their sets. It's slow and pretty, with neck slides that could become slow silky glissandoes. Silky and breezy. There must be a billion versions of "Sweet Leilani" out there. Liquid and surfable, it floats on a daydream of a romanticized island paradise and a golden wahine. This seems a little to continental to me, even for tourist music. I can't get into it. This bouncy number might have come out of the slack key tradition. It's fun and faster than many here. It's innocent lilt might make it hard to reverb successfully, lest you remove your attitude collar and put on your grin. This Les Paul original is heavily island influenced, but seems more like Chet Atkins than a Polynesian delight. This classic island tourist sing-along is the inspirational source of some surf instros, such as the Impacts' ultra cool "Sea Horse." This arrangement is a little too pristine and touristy, but the islands are clearly in view. Relaxed and a little contrived, "Hawaiian Charms" speaks of tourists eating coconuts and strolling through the grounds at the Mauna Loa farm in Hilo. Les Paul's floating tune borders more on Jazz and Nashville than Maui. With shimmering vibrato second guitar and silky lead work, this is about as close as this legend gets to rock and roll. It's soft and sweet, islandic, and attractive. Actually written by a Polynesian, "Farewell To Thee" employs vibrato shimmer on the second guitar, which provides surfability and interest. Very cool track.